The Fifa fitness test for referees (men and women) is introduced to measure the physical ability of match officials. The test has been renewed in 2016 and a different test have been made for assistant referees. The test for assistant referees is a little different. If you're still looking for the test that was used before this one, check the old high-intensity interval test (the one with 150m sprints). The official fitness test for football referees consists of two tests. Test 1, Repeated Sprint Ability (RSA), measures the referee’s ability to perform repeated sprints over 40m. 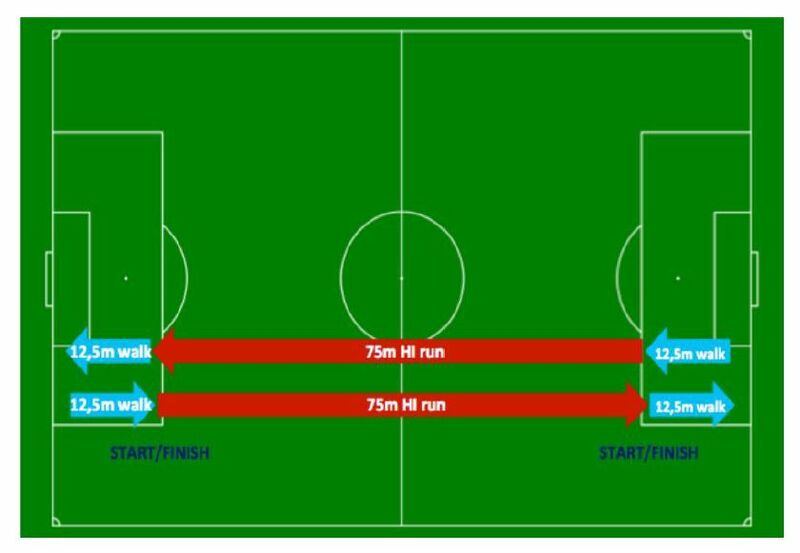 Test 2, Interval Test, evaluates the referee’s capacity to perform a series of high-speed runs over 75m interspersed with 25m walking intervals. The time between the end of Test 1 and the start of Test 2 should be 6 to 8 minutes maximum. Tests must be performed on an athletics track or a natural/artificial football field. Athletic spikes may NOT be worn during the tests. The ‘start’ gate should be placed at 0m and the ‘finish’ gate at 40m. The ‘start line’ should be marked out 1.5m before the ‘start’ gate. Referees should line up at the start with their front foot touching the ‘start line’. Once the test leader signals that the electronic timing gates are set, the referee is free to start. 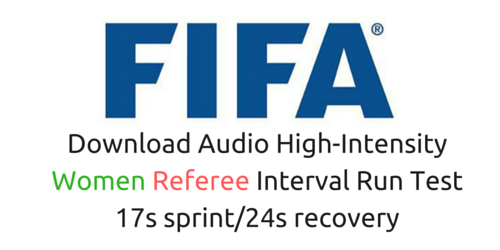 Referees should receive a maximum of 60 seconds recovery between each of the 6 X 40m sprints. During their recovery, referees must walk back to the start. If a referee fails one trial out of the six, they should be given a seventh trial immediately after the sixth trial. If they fail two trials out of seven, the match official has failed the test. At the end of each run, each referee must enter the ‘walking area’ before the whistle. The walking area is marked out with a line 1.5m before and 1.5m behind the 75m line. If a referee fails to place a foot inside the walking area on time, they should receive a clear warning from the test leader. If a referee fails to place a foot inside the walking area on time for a second occasion, they should be stopped by the test leader and informed that they have failed the test. If you want to train at home with the Fifa Interval Test, it's much easier with audio files. You can download the specific files you need via the buttons below and play them on your phone or music device. You'll hear beeps so you know exactly when you need to be ready with a 75m sprint or when your time for walking is over and you need to get ready for a sprint again. The other beeps will notify you when you have 10 or 5 seconds left before your sprint must be finished or before the next sprint will start. If you want to train at home with the Fifa Interval Test, it's much easier with audio files. You can download the specific files for women referees via the two buttons below and play them on your phone or music device. Good luck with the tests. The beeps will also notify you when you have 10 or 5 seconds left before your sprint must be finished or before the next sprint will start.